So, what do you think so far....fantastic release, ha??? I am telling you, I thought last month was one of my favorites...but this is hands down my favorite for me so far! Monkey See Monkey Do stamp set. I made a cute tag to match using the Treat Tag Die for the base. I created my own background by stamping the monkey faces on it and then layered this cute monkey on it. The banner is from the Mini Tag Dies. I finished by filling a cello bag full of root bear barrels and tying the tag on with ribbon from Pretty Pink Posh. 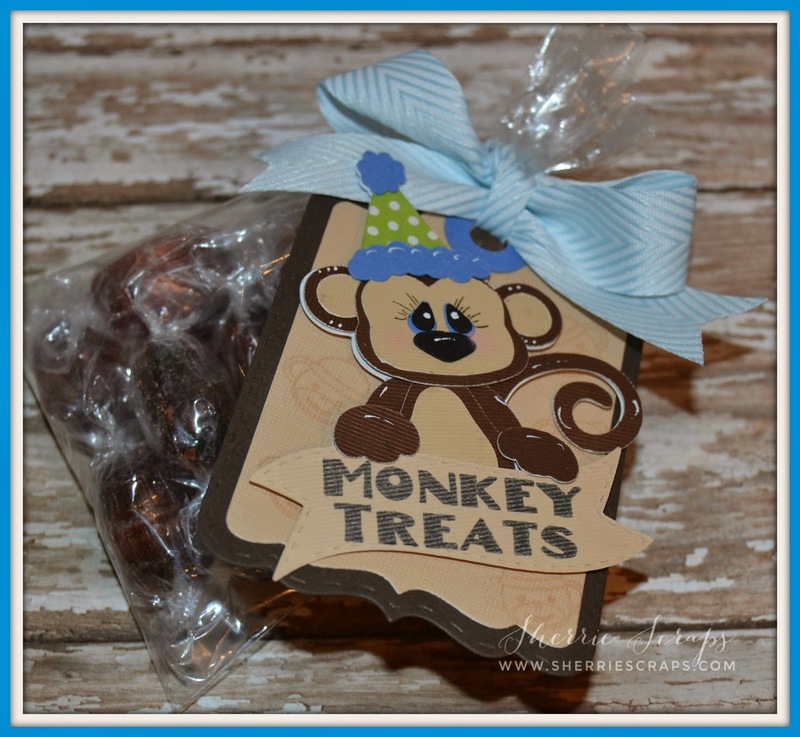 I also made this cute treat all decked out using this stamp set! I started with the Candy Caddy Die for the treat box. 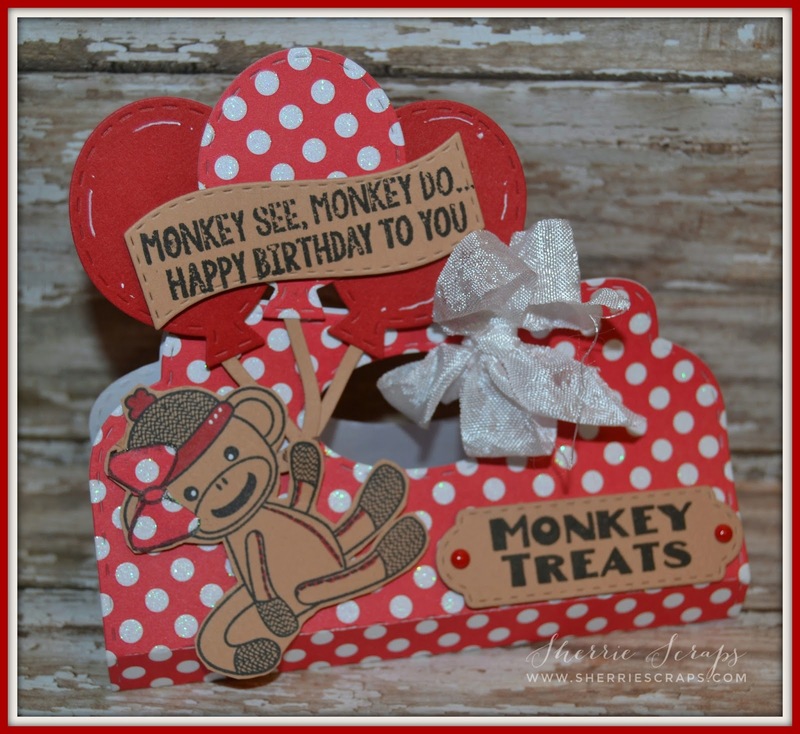 The banners are from the Mini Tags Die and Mini Tags Die 2 and the sentiments are stamped with the Monkey See Monkey Do stamp set. 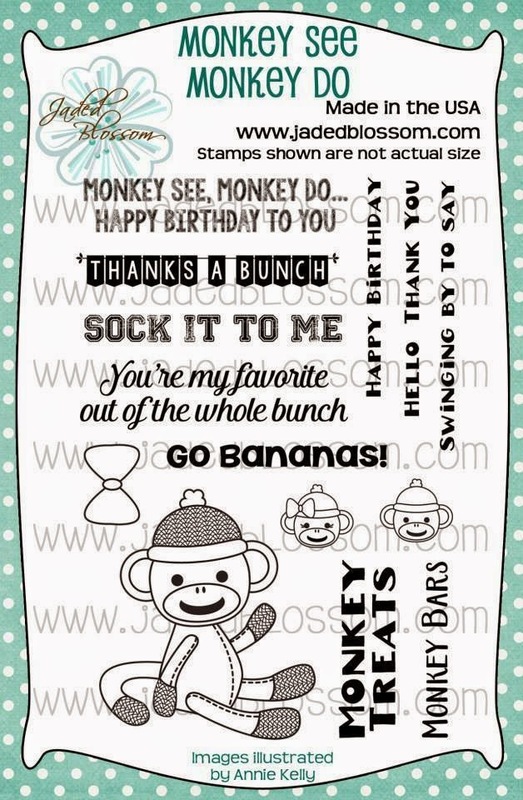 The monkey is also from the Monkey See Monkey Do stamp set, stamped and fussy cut out. I just love this little sock monkey!!! The balloons are from the Birthday Dies. I finished with a fun double bow using crinkle ribbon from 3Girl JAM. That's it for today! Be sure to stop over at Jaded Blossom to check out the inspiration from the Design Team. I will be back tomorrow with another fun project to share! This is adorable, both of them! Both of these are cute as can be! 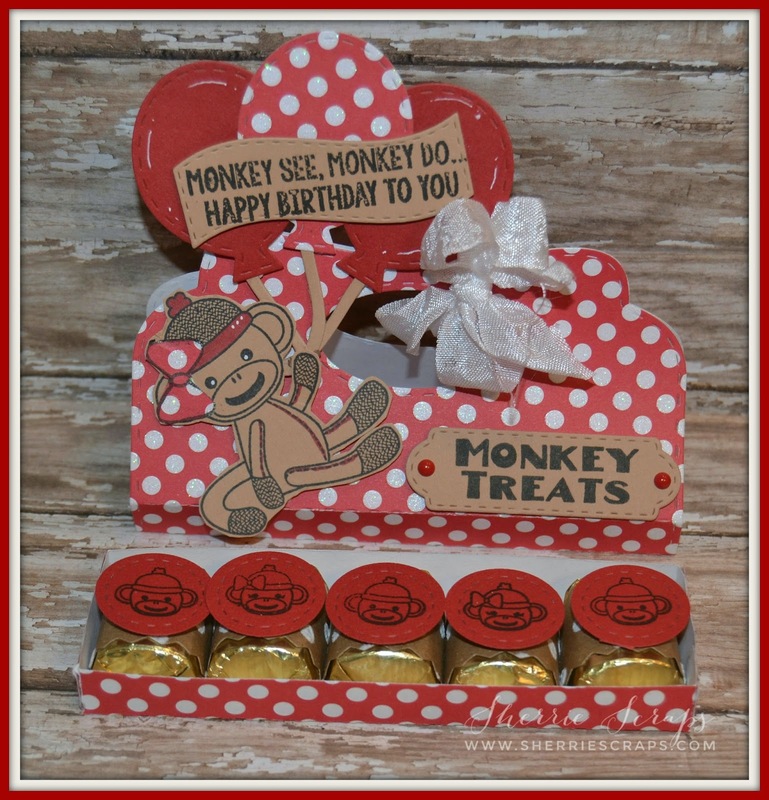 LOVE that barrel with the monkey and the red polka dot paper is fab on the candy caddy! MONKEYS!!!!!!!!!!!! I love love love these!!!!!!!! Those monkeys are just ADORABLE!!!!!!!! And loving how you turned the coconut drink holder into a barrel!!! That is GENIUS!!!!!!!!! OMG how adorable are these!!!!! Super FAB projects Sherrie!!!!!!! Sherrie!! These are both freaking adorable! 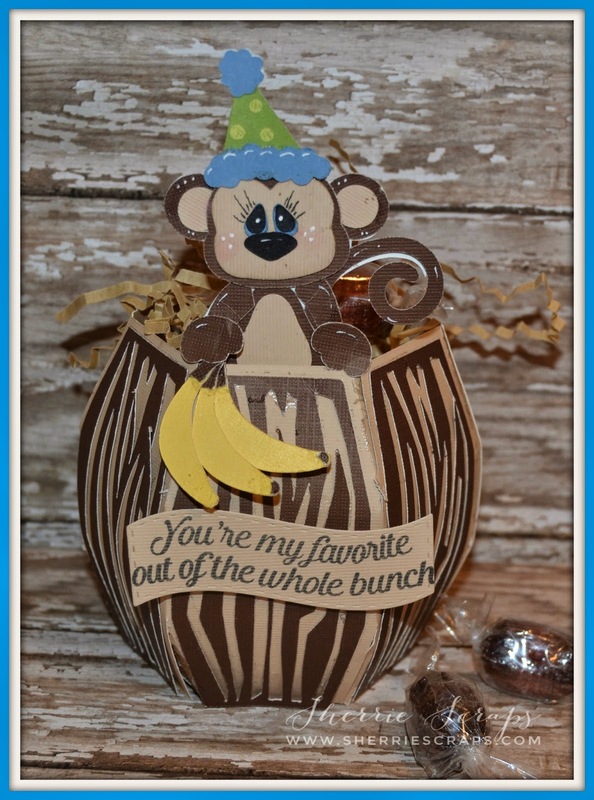 I love the barrel and how you used the candy caddy die! Awesome job! Haha- loving this!!! Must have the monkey! 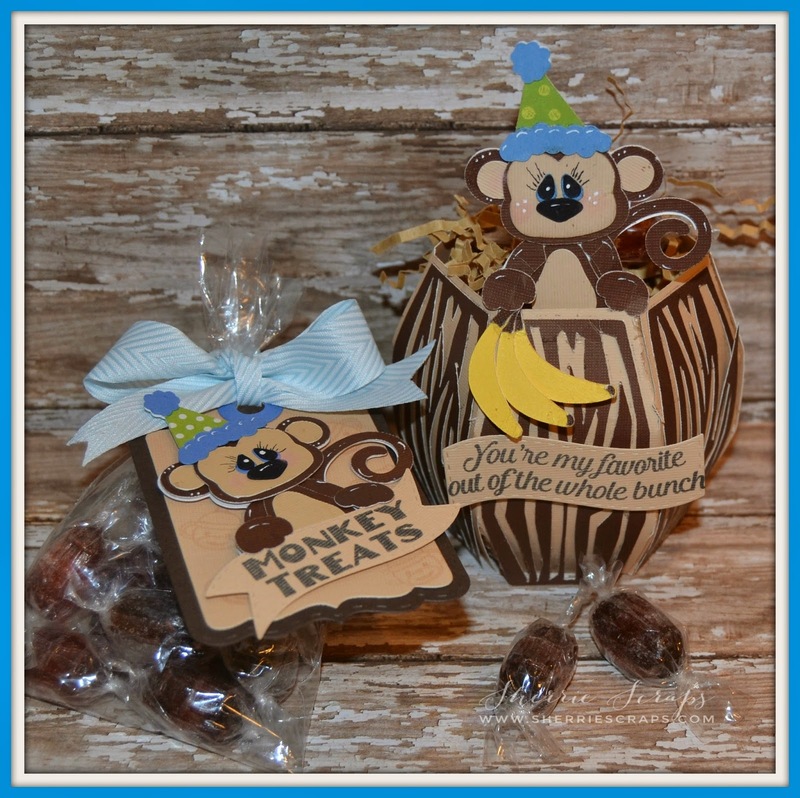 Awesome projects, just love those monkeys, especially the one in the barrel! You are doing such an amazing job with all of your fun and creative projects this week! eeeekkk these are sooooo stinkin cute ! love the barrel monkey so awesome !! Great job! they all look fantastic! OMG girl you are really doing a awesome job with the release. Love them both. The money is adorable on both and fabulous paper choices. Would love to have you link them both up over at 2 Creative Chicks. OMGOSH ~ this just cracked me up! The monkey barrel is over the TOP ~ ADORABLE!! How CUTE is this idea! Then the sock monkey ~ way too CUUUUTE too! You did such n AMAZING job with these too! OMG, these are just adorable! I LOVE the coconut and monkey!! !